At Gamescom 2016, Microsoft released new gameplay footage for Gears of War 4 in glorious 4K resolution. The move was simply a means to promote the fact that Gears of War 4 will release on PC this year with support for 4K video resolution. Now that is going to make a lot of players happy. The new footage features the game’s main characters JD, Kait, and Del pursuing an enemy through an old abandoned COG fort. Falling for an enemy trap, they are faced with Swarm Drones and Pouncers. The resulting combat is bloody, brutal, intense; all the traits of a Gears of War game. Microsoft also released “minimum, recommended and ideal” system requirements for the Windows 10 PC version. 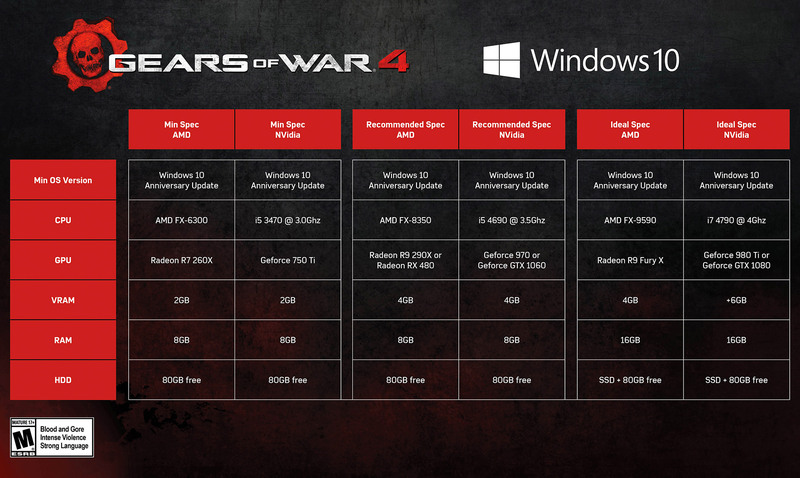 It’s mandatory that everyone updates their operating systems to the new Windows 10 Anniversary Update, as that’s the minimum requirement to run Gears of War 4 on PC. From the looks of it, the game will release with several exclusive Nvidia features as the requirements reveal that Nvidia GPU owners are going to require more than 6GB of VRAM to play the game at max. Those with 8GB of RAM are going to be in the clear, and you’ll require at least 80GB of free hard drive space. Gears of War 4 is scheduled for release on October 11 for Xbox One and Windows 10 PC. It will come with the support of Microsoft’s new “Xbox Play Anywhere” program, meaning fans can purchase the game once and play it on both platforms.